Patricia Townsend demonstrates how to make biodiesel from vegetable oil. Biodiesel, which is typically made from canola or waste oil, is just one example of renewable transportation fuels. In the Pacific Northwest there are several feedstocks and refineries to support an emerging biofuels industry. Heppenstall works on the Advanced Hardwood Biofuels Northwest (AHB) project, which is researching poplar trees as a potential feedstock for jet-fuel, cellulosic ethanol, and other advanced biofuels. A mixture of methanol and lye are added to vegetable oil to make biodiesel. 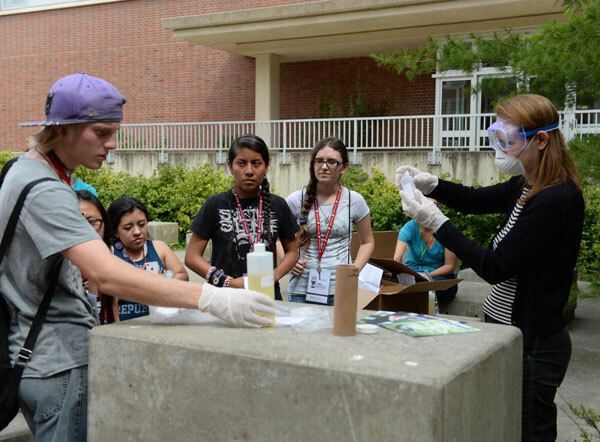 Teens held a bag with the mixture of lye and methanol and felt the heat released during the process. 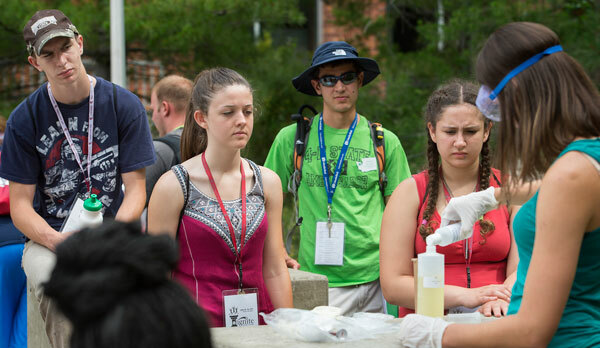 The mixture was then transferred into the vegetable oil where students shook the bottle and watched as the glycerin settled to the bottom and biodiesel rose to the top.